Dr. Peggy Froerer is a Research Lecturer in Anthropology at Brunel University. She completed her PhD in 2002 at the London School of Anthropology, where she remained for a further two years as a Research Fellow. She has worked in a mixed, Hindu/Christian adivasi (tribal) community in Chhattisgarh, central India since 1997. Her doctoral thesis (in press, Berghahn) examined the emergence of Hindu nationalism in this community. Much of her recent work is concerned with the way in which children acquire the cultural knowledge and concepts held by adult members of their community. One aspect of her current research focuses on children’s understanding of illness and healing, with a specific focus on children’s reasoning about natural and supernatural illness causality. She is also interested in the issue of social group identification, and a second aspect of her work explores the cultural and cognitive processes by which children are come to know and articulate an understanding of the social groupings to which they affiliate themselves and from which they exclude others. Mohanpur Village, Chhattisgarh, Central India, in one of the more densely forested regions of central India. It is located 1.5 hours from the nearest town (Korba) and is reachable by jeep. There is no electricity or running water. Chetriboli, a dialect of Chhattisgarhi (which is a dialect of Hindi); spoken by all villagers. The village is divided into 8 jatis (castes or social groups), 93% of whom are adivasi, or ‘Scheduled Tribe’. Groups categorised as ‘Scheduled Tribes’ in India today are generally those formerly called ‘tribes’ by the British. The identification of ‘tribes’ thus involved a relationship between the British concept of the more ‘civilized’ Hindu society, defined by their understanding of the caste system, and the ‘primitive’, wild periphery which dotted the edges of its social and geographical domain. Groups that could not be classified into major caste or religious categories were labelled instead on the basis of the general impression about their physical and socio-cultural isolation from mainstream, caste-bound Indian society. 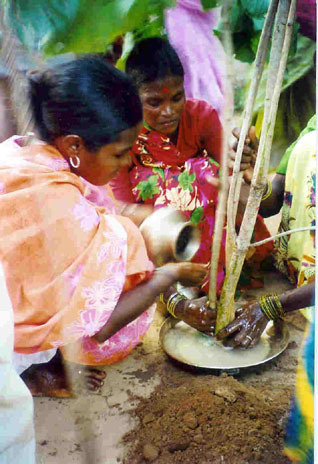 Local adivasi groups include Ratiya Kanwar, Majhuar, Dudh Kanwar and Oraon; non-adivasi groups include Yadav, Panika, Chohan, and Lohar. All groups are Hindu except for the Oraon adivasis, who are all Christian. The majority of local people depend on a combination of rice cultivation, the collection and sale of non-timber forest products and wage-labour for their livelihoods. Most people own or rent between .5 – 4.5 acres of land on which they cultivate rice and lentils, the staple crops in this area. They augment this income by selling forest produce such as tendu (the leaf from which the indigenous Indian cigarette, the bidi, is made), mahua (a local flower used in the production of liquor), sal (extracted as a cooking oil) and lac (used to make bangles) on a seasonal basis. Villagers also raise and sell pigs, goats and chickens, and produce and sell handmade sleeping mats and brooms. As recent immigrants to the area, the Oraon Christians have little titled land, and as such are forced to earn the bulk of their livelihoods through wage labour activities. These may include participation in construction or public road works projects sponsored by the state government. 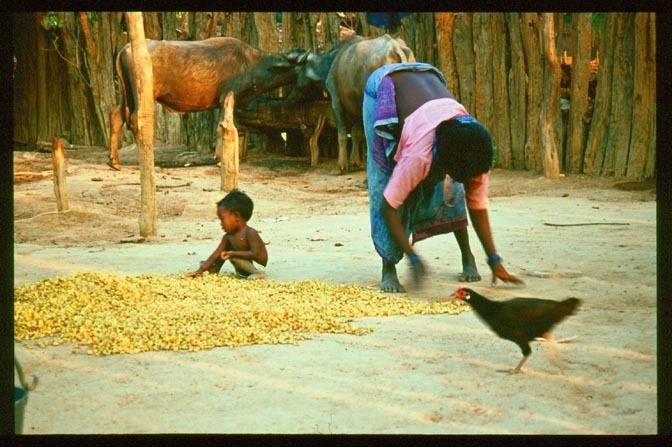 The Oraon Christians also augment their incomes with money derived from the production and sale of liquor that is distilled from the mahua flower. The supplementary wealth of the Oraon community is largely in the form of cash and material items, whereas the wealth of the Hindus is in the form of paddy, which is derived from their own land and from the collection and sale of forest produce. The money that the Oraon Christians derive from such work has enabled them to serve as moneylenders to the Hindu community. This has created increasing economic and communal tensions within the community. While three-quarters of the village population are classified as Hindu, the kind of Hinduism that is practiced locally is very different from the more ‘sanskritised’ Hinduism that is practiced in more ‘mainstream’ Hindu society. Instead of ‘big gods’ like Ram, Krishna or Shiva, for example the kind of divine beings with which local Hindu adivasis primarily interact include ancestor spirits, along with the myriad clan, village and jungle deities that live off the land and in the forest. Local adivasis engage with these supernatural beings through possession and through making regular offerings of blood and liquor. One quarter of the population is Christian. This group is comprised solely of Oraon adivasis, who are descendants of converts who joined the Catholic Church during one of the mass conversion movements that took place in Chhattisgarh in the 1930s. In spite of being Christian for more than two generations, most local Oraons still engage in traditional adivasi religious practices (sarna dharm), which include regular blood sacrifices to ancestor spirits and clan deities, and indulgence in ‘supernatural’ healing practices. Local Catholic priests have adopted increasingly aggressive strategies to punish engagement in what they call ‘shaitan ka kam’: satan’s work. The local kinship system is broadly Dravidian, with preferential cross-cousin marriage and a taboo on parallel cousin marriage. While cross-cousin marriage is not always possible, people do tend to practice clan exogamy and caste endogamy. Village life is marked by hierarchical relations at the caste level. The dominance of the Ratiya Kanwar ‘high caste’ is largely due to a combination of ‘sons of the soil’ status and landownership. Following this group are the remaining Hindu groups, which include the Majhuars and Dudh Kanwars (both adivasi groups), the Yadav (caste Hindus), Panika, Lohar and Chauhan (all ‘Scheduled Castes’, or former ‘untouchables’). 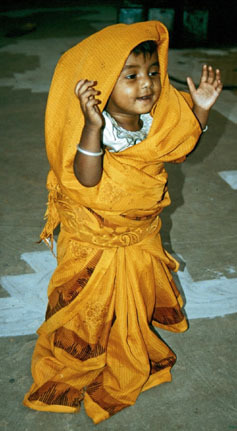 At the bottom of the caste hierarchy are the Oraon Christians, who are considered to be untouchable by all local Hindus. The caste ranking of local groups does not follow the mainstream caste hierarchies found in other parts of India, but represents the broad consensus of the inhabitants of Mohanpur. It is based on local norms of pollution and untouchability and is most visible in terms of occupation and commensality. 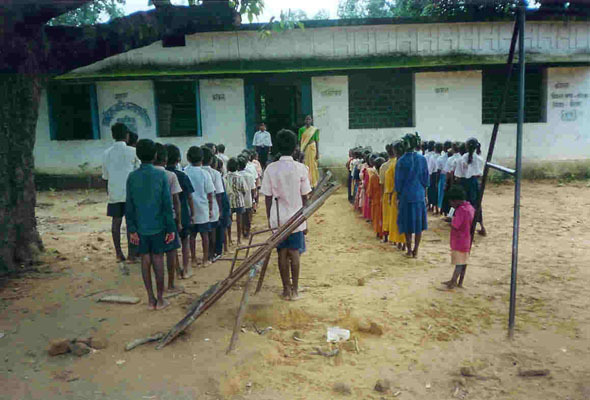 Like many villages in tribal regions across India, formal schooling in Mohanpur was introduced less than two decades ago. Prior to this, most people had little access to schooling, a fact that reflects in the high illiteracy rates amongst the local adult population. Those above the age of 20 – mostly boys – who did attend primary school were forced to board in a larger town several kilometres away. Two decades and numerous government and NGO schemes later, most village children are educated up to Class 5 and have obtained basic literacy schools. While issues like cleanliness and the importance of bathing are topics that are occasionally covered in school, there is no concentrated focus on issues related to biological health or the prevention of illness. Local ideas about illness are broadly divided into two categories: ‘simple’ or natural (sadharan bimari), caused by natural or biological factors like contaminated food or germs, and cured by tablets/injection; and ‘supernatural’ (bhuti bimari), caused by divine retribution for ritual transgressions (such as violation of ritual taboo, trespass into sacred ground, neglect of propitiatory obligations, and random encounters with ghosts). These are cured through divination and ritual offerings. All types of illnesses, such as headache, cold, stomachache, fever, and malaria can be classified as either ‘natural’ or ‘supernatural’. Discovering the type of illness is contingent upon the efficacy of the cure: if an illness is quickly cured through biomedical techniques, then it is said to be ‘simple’ or natural; if not, then it is suspected to be supernatural. At the time of my last visit (February 2005), villagers had two biomedical treatment options: the Catholic-run medical clinic and dispensary, located 6 kilometres away in a neighbouring village, and a local ‘doctor’ with a primary healthcare certificate. Supernatural treatment choices included a range of healers or ritual specialists who has been specially trained to divine illness and communicate with local deities through trance or possession. When someone falls ill, the general pattern is to first try biomedical treatment in order to confirm or rule out that the illness is ‘simple’. People will typically visit the dispensary in a neighbouring village, and get an injection or take the prescribed course of pills. If the illness continues after this treatment, and beyond what is considered to be an appropriate period of time (usually between one and three days), then it is suspected to be supernatural, and a local healer will be summoned to divine the cause. Google Earth allows you to explore sites anywhere in the world using satellite images of those sites. So you can go to the fieldsite and navigate around to explore it in detail. To use this feature, you may need to download the Google Earth program onto your computer. This program is available for free here: Google Earth. Once you have done this, just click on the following links and navigate around the fieldsite from there. Google Earth KMZ files for Chhattisgarh. NB: right-click on these files & save to your computer. Peggy Froerer (in press). Religious Division and Social Conflict: The Emergence of Hindu Nationalism in a Central Indian Tribal Community. Berghahn, UK; Social Science Press, New Delhi. Peggy Froerer (forthcoming). Activists and Adivasis: Hindu nationalist militants in Chhattisgarh, central India. In David Gellner (ed.) Activism and Civil Society in South Asia. New Delhi: Sage Publications. Peggy Froerer (forthcoming). Education, Globalisation and the Preference for Hindu Schooling in Central India. In David Johnson (ed.) Oxford Studies in Comparative Education Series. Oxford: Symposium Books. Peggy Froerer (2007). Disciplining the Saffron Way: Moral Education and the Hindu Rashtra. Modern Asian Studies, Vol. 41. Peggy Froerer (2007). Wrongdoing and retribution: children’s conceptions of illness causality in a central Indian tribal village. Anthropology and Medicine, September 2007. Peggy Froerer (2006). 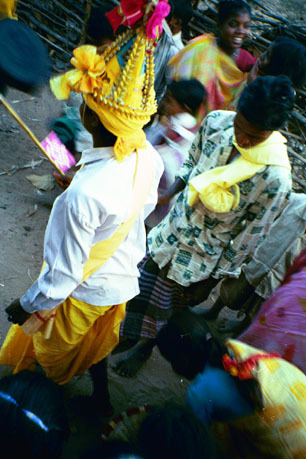 Emphasising Otherness: an Ethnography of Hindu Nationalism in a central Indian Tribal Village. Journal of the Royal Anthropological Institute, 12, 39-59. Peggy Froerer (2005). Challenging Traditional Authority: the Role of the State, the Divine, and the RSS. Contributions to Indian Sociology, 39.1, 39-73. Peggy Froerer and Nicola Knight (in progress). Cognitive conceptions of illness causality, Chhattisgarh, central India.